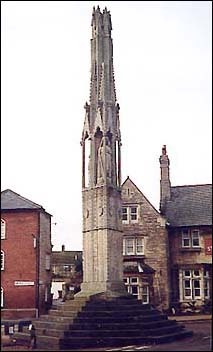 In 1290, Eleanor of Castile, the wife of Edward I, died at Harby, Nottinghamshire. The beautiful tomb that Edward erected to her memory in Westminster Abbey can still be seen today. The places where her funeral cort�ge rested on the journey south to Westminster were marked by stone crosses, only three of which now remain intact: in the centre of Waltham Cross, Herts; at Hardingstone, on the edge of Northampton, and also here in Geddington.